Welcome to All 4 Fun Rentals! Bounce house rentals are taking the world by storm. People often don't know what to call them though: bounce house, moonwalks, jumpers, bouncers or even a kids party inflatable thing. Whatever you want to call them we call them fun and we have a great selection with a variety to choose from. 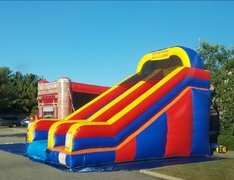 We also have inflatable slides, water slides, a dunk tank, chairs and tables. Give us a call or reserve on-line and we promise a great time. Sit back and let us do the work! 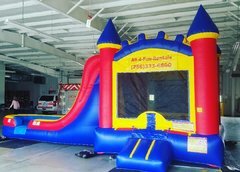 All 4 Fun Rentals brings the fun to you for your birthday parties, block parties, company picnics, HOA's, corporate events, school & church carnivals, VBS, fall festivals, car shows, family fun day, field day, grand openings, holiday events such as Easter, 4th of July, Labor day, Memorial day and more! 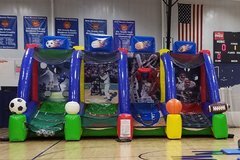 All 4 Fun Rentals will deliver and set up your bounce houses, moonwalks inflatable slides, inflatable bounce combos, interactive games, for the easiest birthday party or event you'll ever have. 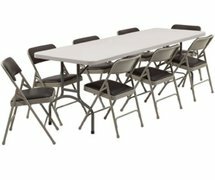 We are available for party rentals in Huntsville/Madison County area. We are licensed and insured. Highly recommend All 4 Fun rentals! 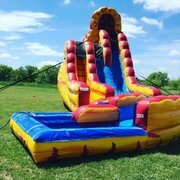 We rented the water slide/bounce house combo for my sons party and it was a big hit! We rented the princess castle for our daughter's birthday party and it was a huge hit! The entire process was simple & very professional. We highly recommend! All 4 Fun Rentals was awesome! Very friendly and professional. I rented the big princess bounce house and it was a huge hit. I highly recommended!